The Below depicted Demographic Map is a simplified view of the distribution of the Islamic Faith in Africa, Europe, Central Asia and East Asia. There are several different streams of thought within Islam, of which the Sunni and Shia directions are the most dominant. Worldwide, roughly 85 % of all Muslims are of the Sunni Denomination, whereas roughly 15 % of Muslims are of Shia Denomination. The Third stream of thought in Islam is Sufism, which is not strictly a denomination. Sufism can be seen as a mystical-ascetic form of Islam and is considered a somewhat controversial and small minority. Iraq has a large minority of Shia's, however until recently was dominated by the Sunni Minority under the officially atheist Dictatorship of Saddam Hussein and the ruling Baath Party. This situation ended with the american Invasion of Iraq in 2003. The new Republic of Iraq, founded in 2005 may end up being dominated by the Sunni Denomination of Islam. The "Artificial"-Nation of Afghanistan has a large Shia Minority, however until recently was dominated by fundamentalist Taliban Movement and later Government of Sunni Denomination. The Taliban were wiped out in an american Blitz-war in 2001 (the first 3d integrated battlefield operation in history. And supported by Shia Iran), but are still active in the Northern Tribal regions of Pakistan and in and throughout Afghanistan today. An elected Government has been trying to establish its supposedly Democratic Rule in Afghanistan and establish a functioning State with help of NATO through the United Nations, however the operations and plans have been fraught with problems, too many and too complex to try and explain here. Last but not least should be mentioned the Arabic Republic of Yemen, a Middle Eastern country located on the Arabian Peninsula. Yemen has a large Shia Population, which shares in Government. However struggles between both Denominations are frequent and sometimes result in violence. As this map clearly shows, the most dominant direction in Islam is the Sunni Variation. Sunni Islam is the most widespread form of Islam, its influence reaching from the Atlantic Shores of West-Africa, through Turkey and the Middle Eastern Regions all the way to Central Asia, India and Bangladesh and covering the Indonesian Archipelago. In Fact, the only Nation in the World to be (politically) dominated by the Shia Version of Islam is the Islamic Republic of Iran, established in April 1, 1979. The only other nation with a Shia Majority is the Republic of Azerbaijan which shares a Culture with the region of the same name in North Iran. successor to the messenger of God (referring to Muhammad as Prophet).Some academics prefer to transliterate the term as Khalīf) to the Tang Emperor Gaozong (Li Zhi). This high level cultural and diplomatic exchange took place only 20 years after the death of the founder of the faith Muhammad, a time during which Chang 'An, the Capital of the Tang Empire was not only the largest but also the most international City in the World. In the aftermath of the visit of Sa`ad ibn Abi Waqqas and in recognition of the importance of the Caliphate on the Arabian Peninsula, a mosque was constructed in the southern City of Guangzhou (Canton) in current day Guangdong Province. At Guangzhou, Muslim Traders sailing on the emerging Maritime Silk Road would dock for trading with the Tang Empire, hence the choice of location. This Mosque has long since disappeared. Not many years later another Mosque was opened in the Tang Capital of Chang 'An. This Mosque, known as the Great Mosque of Xi'An, was originally founded in the year 742 AD, during the flourishing period of the Tang Dynasty under the Reign of Emperor Tang Xuanzong (712 AD - 756 AD). Today, a mosque still stands on this spot although the current structure was built in the 14Th Century AD. The so called Great Mosque of Xi'An is the Holiest Shrine of the Hui Ethnic Minority and can be visited inside the pittoresque Muslim Quarter of the Old City of Xi'An, formerly Chang'An and now the Capital of Shaanxi Province. The still very active Great Mosque of Xi'An ranks high on the list of the 11 remaining historic mosques in China, furthermore Xi'An's Great Mosque and its surrounding Lanes of the Muslim Quarter have been been included in the UNESCO listing as a World Cultural Heritage Site of Islamic Culture. Treasures include Caligraphy works by Mi Si dating from the Song Dynasty, A Hall of Stele Tablets from the Ming and Ching Dynasties with inscriptions in the Chinese, Arabic and Persian Languages and more. 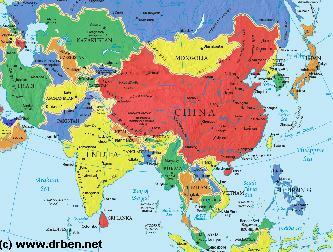 After its introduction in China in the 7Th century Islam and Muslims played an important Role in Chinese History. During the Song Dynasty Islam was already well established as one of the main religions of the Nation, although it played a minor role in comparison to Buddhism, Daoism and Confucianism. Islam was carried to China both through the land-bound Silk Road paths through which contacts with the Arabian Peninsula had already been established as early as the Han Dynasty (206 BC - 221 AD)(Reign of Hanhe Emperor), but also increasingly through Maritime Contacts through the South-China Sea and Indian Ocean, then from the Chinese Coast on to Chang'An the Capital. 1) First and Foremost is the HuaiSheng Mosque in Guangzhou (Canton), Guangdong Province. The HuaiSheng Mosque was constructed during the Tang Dynasty Era. Reportedly it even dates from the year 627 AD, well before the year 651 AD and the first Islamic Dimplomatic Visit to the Tang Court (see above). The exact date of establishment however is unsure. Alledgely the HuaiSheng Mosque in Canton was founded by a succesful Arabic Trader, who is supposed to have been an Uncle to the Prophet Mohammad. There are however reasons to doubt this claim. The HuaiSheng Mosque today is the Cultural Center of the over 5000 strong Muslim Community of Guangzhou. It feautures an impressive 25 Meter high Minaret. 2) QingJing Mosque, also know as Shengyou Mosque or Masjid Al-Ashab in Quanzhou, Fujian Province, constructed during the Song Dynasty. The Shengyou Mosque was originally constructed in black and white marble, a copy of an original Mosque in the (As)Syrian City of Damascus. During the Song Dynasty the City of Quanzhou was an important trading harbor and part of the Maritime Silk Road. At this time the city already counted over 500.000 citizens, among them many Muslim Traders who had been settling in the City since the 7Th Century AD. Testament to this early Islamic Presence are mainly the Yisalanjiao Sheng Mu - or Islamic Holy Graves, built on the Ling Shan, the mountain of spirits found at the Eastern Side of Quanzhou City. The Yisalangjiao Sheng Mu are the resting places of early Islamic Missionaries of the 7Th Century. Constructed much later in the year 1009 AD, is the Shengyou Mosque. Shengyou Mosque today functions as the Museum QingJing Si, Temple of Peace and Clarity. A small exhibit inside the Mosque with english language descriptions gives an overview and backgrounds to the life of the once very large Muslim Community of the City. was first constructed during the Southern Song Dynasty (1127 AD - 1279 AD). During the years of the Yuan Dynasty (1271 AD - 1368 AD) Yangzhou was the home of Marco Polo - or so he claimed -, where he was the Major of the City for several years. It is very likely, although not recorded, that at the time Marco Polo could have visited the Mosque. Regardless of its ancient history and cultural relevance the Xianhe Mosque of Yangzhou is not listed in major travel guides and the rich Islamic History of the City has so far has been ignored by tourists. Information on it is hard to find. More emphasis is put on Yangzhou's Culture of High Quality Craftsmenship, Folk Art and the historic Grand Canal on which Yangzhou was a major City during the Tang Dynasty (618 AD - 907 AD) and Song Dynasty Era's (The Grand Canal was THE major South to North pathway for internal trade. It was constructed during the Tang Dynasty, further developped by the Song Dynasty, and finally modernized and expanded to reach Beijing on orders of the Yongle Emperor of the Ming Dynasty. The Canal was one of the major reasons for the Islamic Presence). 4) Fenghuang Mosque in Hangzhou, Zhejiang Province, constructed during the Yuan Dynasty and the Mongol Empire. The name of the Fenhuang Mosque translates as Temple (Mosque) of the Feniks, which is appropriate for its turbulent history. Originally the site of a Mosque constructed for Arabic and Persian traders who travelled through Hangzhou and the Lakes of Zhejiang via the Maritime Silk Road during the Tang Dynasty Golden Era, the Mosque was destroyed and rebuilt several times in history due to ethnic/religious and other conflicts. One of the latest destructions dates from the early 19Th Century esotherical-christian Taiping Rebellion and the Mosque was recently rebuilt and re-opened in 1984 AD (under the Political Leadership of Deng Xiaoping). The Fenghuang Mosque treasures a large collection of ancient arabic inscriptions. As can be deduced from the locations of these 4 remaining Mosques, the majority of Muslim Communities were formed at Harbors and in important trading cities, especially in the South of China.